Custom Oval Heads & Semi Tubular Rivets | Hialeah, Florida | Uniriv Inc. The OVAL HEAD, SEMI-TUBULAR rivet is the most commonly used rivet. Listed below are standard dimensions for this rivet, as well as a simple method for determining the proper rivet length. The length of the rivet is determined by adding the clinch allowance (see table above) to the total thickness of the work. Specify the length to the nearest fraction. NOTE: VARIATIONS IN MATERIALS OR CONDITIONS OF ASSEMBLY MAY REQUIRE DEVIATIONS FROM ABOVE. 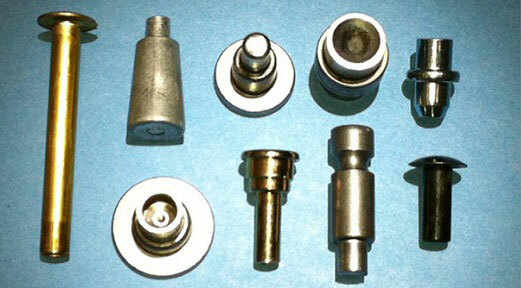 TO BE SURE, SUBMIT SAMPLE PARTS TO THE FACTORY FOR TEST ASSEMBLY.